One popular investing myth is that the market always efficiently prices stocks. The truth is that active traders have a herd mentality, and often push prices to extreme levels in the short term. That’s when it truly pays to be a contrarian, to be able to buy when prices are down and dividend yields are up. I believe this is currently the case with energy master limited partnerships (MLPs). Crude oil fell 7% in July, which was its worst monthly performance in two years. Natural gas also declined more than 4%. However, the two names I’ve found are pipeline and transport firms that have largely fee-based businesses and are not affected by a temporary drop in energy prices. The stocks have lost more than 20% in 2018, but are increasing dividends and could begin to recoup those losses by the end of the year. EQT Midstream Partners (EQM) is an energy MLP banking that a simpler structure will attract more investors to the name. The company gathers, transports and stores natural gas and is currently in the process of combining three businesses into one. Earlier this year, EQT Midstream bought the remaining midstream assets from its parent, EQT (EQT) and merged with sister MLP, Rice Midstream. The deal is expected to cut annual operating costs by $15 million, improve capital efficiency by $500 million and be immediately accretive to distributable cash flow. 72% of revenue in the second quarter was generated from fixed-fee contracts, which insulates the company from a temporary drop in energy prices. This should all be welcome news to investors, who’ve seen the stock fall 27% in 2018. 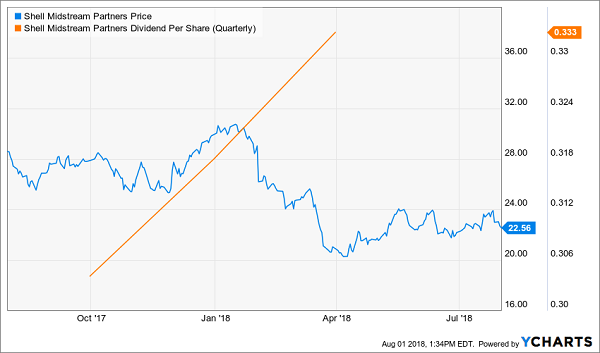 One bright spot is that management has already increased the quarterly dividend three times this year, to $1.09 a share (8.5% yield). EQT Midstream covered its distribution 1.3x with cash flow over the past four quarters and is targeting 15% annual dividend growth in the future. This growth is bolstered by the fact that consensus expectations call for profits to grow 4% in 2018 and another 10% next year. The company also has an investment grade balance sheet and sees no need to raise new equity through 2020. Shell Midstream Partners (SHLX) is an MLP that operates pipelines for oil and refined products. The company was formed in 2015 and is a clear beneficiary of the deep pockets of its parent, Royal Dutch Shell (RDS). Shell Midstream made its largest ever acquisition in May of a pipeline stake from its parent, for $1.22 billion. The company is currently generating over $400 million of annual earnings before interest, taxes, depreciation and amortization (EBTIDA) a year and sees up to $3 billion in potential future annual EBITDA from Royal Dutch Shell assets that are existing or under construction. The shares have lost 22% in 2018, but Shell Midstream now sports an attractive 6.5% dividend yield. Management has boosted the payout every quarter since going public, including three times already this year. This momentum could continue in the future, with consensus estimates calling for 9% average profit growth over the next three years. Turnaround stocks like these can reward patient investors, but why wait for the investing herd to recognize a good value? 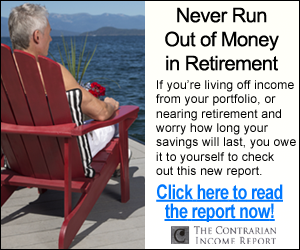 If, however, you’re nearing retirement, or have already retired and are living off income from your investments, I strongly encourage you to check out the top 7 high-yielders from Brett Owens, Contrarian Outlook’s Chief Investment Strategist. All seven are key recommendations in his 8% No Withdrawal Portfolio and check both boxes for “dividend growth” and “high current yield”. 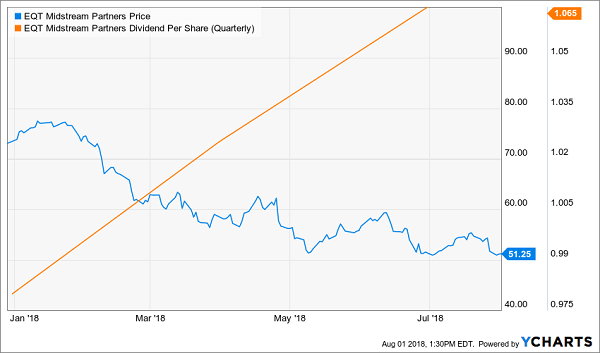 Combine 5% to 10%+ dividend growth with these high-single-digit current yields, and we have a formula for safe 15% to 20%+ annual gains, with a significant portion of that coming as cash dividends. And thanks to the new tax plan, there’s never been a better time to buy these issues and live off their dividends. But it’s important to choose wisely. We’d love to share Brett’s seven favorite recession-and-rate-proof high-yielders with you – including specific stock names, tickers and buy prices. 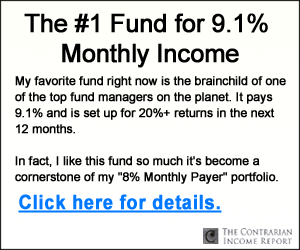 Click here and we’ll send our full 8% No Withdrawal Portfolio research you to right now.